And more frequently for those who have risks for eye disease or have any kind of eye conditions or diseases. 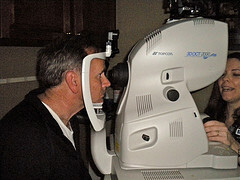 It may surprise you, but it didn't surprise our optometrist that I came along to Bill's eye exam. Because of a strong family history of age related macular degeneration he is at a higher risk of developing this retinal disease. I wanted to be there during the retinal portion of the eye exam to ask some questions about his macula and what the eye doctor was seeing that may indicate any early signs of AMD. Did you know that the retinal exam can show initial changes in the macula even before a patient experiences any changes in their vision?